Dawn Bailey, Soprano; Susan Toman, Harpsichord and Celtic harpist. Photo: supplied. 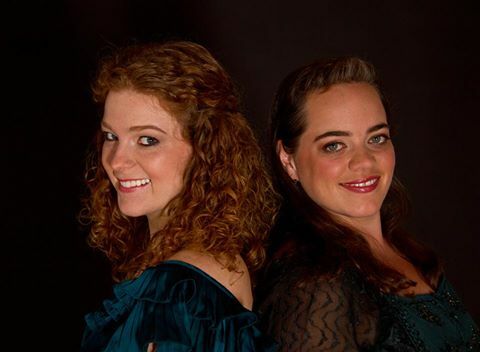 Ensemble Seraphina, a vibrant new duo, composed of Soprano, Dawn Bailey, and Susan Toman on Harpsichord and Celtic Harp, offers a musical fusion of chamber music and traditional folk melodies from the Isles. Toman's decisive harpsichord and harp clarity paired with Bailey's lilting voice results in raw and honest storytelling essential in the performance of traditional music. Edmonton audiences will have the chance to hear the music form their newly released, Road to the Isles, C.D., this Friday. 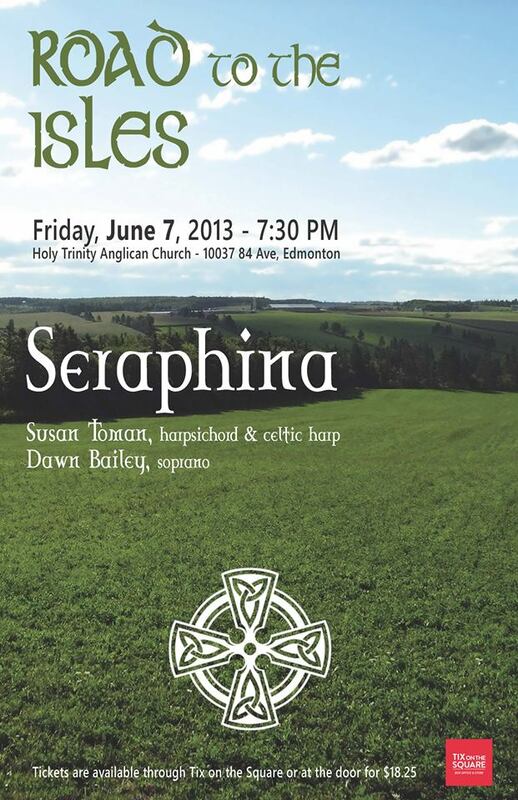 Learn more about Ensemble Seraphina below as Dawn Bailey discusses the origins of Ensemble Seraphina and their goal of presenting a musical chronology of inspiration in their Road to the Isles concerts that will take them from Alberta this month to the East Coast of Canada in July. What can audiences expect from performances this weekend? The concert repertoire really is very relevant for both locations, though, as it gives a glimpse into some of the cultural and musical roots that many Canadians can trace part their heritage to - that of England, Scotland, and Ireland. The programme is entitled "Road to the Isles" and it mainly focuses on the folk songs and chamber music that came out of England, Scotland, and Ireland in the seventeenth and eighteenth centuries, but also has connections to music that was and continues to be prevalent in the folk tradition of Canada's own eastern Isles. Both Susan and yourself have unique musical specialties , what sparked this musical collaboration? Susan is a harpsichordist first, and a harpist second, and we've worked together before on numerous Baroque projects. It turns out that both of us have had a secret longing to perform Celtic music for years, because one day when I came into her house for a rehearsal (of Baroque repertoire) I saw her Celtic harp in the corner and said that I'd love to sing with her playing the harp someday! We put together a programme of music for Christmas and performed a house concert in Montreal, and had such a positive response from the audience that we decided to keep going and form the Ensemble Seraphina. The fact that we both have experience in both styles gives our interpretations a flexibility and uniqueness that not many other Celtic groups have - in this concert we are performing not only folk music, but also chamber music that was written by composers who were living in the seventeenth and eighteenth centuries whose music was inspired by the folk traditions of the time. Is there a difference with performing with harp vs. other instruments? There is something very wonderful and intimate about singing with the harp. It is an instrument that has inspired the creation of many myths and stories, since the sound of the harp can evoke such intense emotions of longing or wistfulness, or love. We will be telling some of these stories and reading poems during the concert as well, to try to give audiences more of an idea about the mythical origins of the instrument in addition to what they hear. What is your favorite part of performing traditional music? My favorite part of performing traditional music is that there aren't so many rules! It is very expected that the performer will make a folk song his or her own, whereas many pieces that are included in the Classical canon or are very well-known have some very specific "traditional" requirements from performers, which might not always fit with their own vision for the piece. I love the freedom that comes with performing folk music -- it is definitely different each time we perform! Do you feel any pressure to reinvent or adapt traditional music for modern audiences? Rather than reinventing or readapting any of the traditional music, what we are doing here is presenting it alongside music by Purcell, Byrd, and other Baroque composers who were inspired by this traditional music in their compositions. So rather than adapting it in a more modern way for modern audiences, we are kind of doing the opposite -- presenting it in more of a historical context than folk music often is presented. And ironically, this makes it all the more relevant to people today, because it becomes clear that themes of love and loss and childhood are still as present today as they were then. Any particular piece you are looking forward to most in the performance? There's one piece that we added near the end of our planning for this concert, and then we ended up naming the concert after it! "Road to the Isles" is a really fun and toe-tapping piece that we are doing right before intermission and it is sure to bring a smile to everyone's face! Any concluding thoughts you would like to add? We are performing another version of this concert on Saturday at noon in Camrose, and it also includes lunch. This is a very special concert since it is taking place at the Open Door Cafe Connections, which is an organization that helps to provide youth at risk with work opportunities. All the proceeds from this Camrose concert are being donated to the PEER Youth Connections program. We will have our brand new CD, Road to the Isles, available for sale at both concerts!